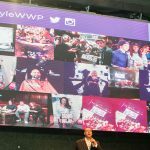 Your branded social media display will boost social media participation by transforming into a super fun photo collage of your event. 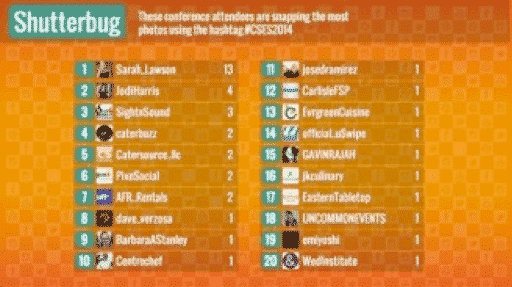 Social media displays remind attendees to share photo-worthy moments. SocialPoint pulls together content from Twitter, your event photographer and SMS (texts) to get a complete picture of your event. When it all comes together you look awesome and it tells a great story. People love seeing themselves on a big screen. The bigger the screen the better! 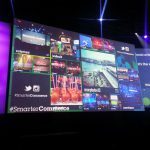 Do yourself a favor and project your social media display on the biggest screens your event can afford. Your attendees will be mesmerized by looking at pictures of themselves. Your sponsors will thank you for all the love afterward. Special event producers love this mesmerizing visualization. Content bubbles burst into a series of smaller bubbles. These animated squares are constantly in motion flipping content. Choose one of four different grid styles. Everyone loves to see their name in lights! Create simple social media games from our 7 leaderboards to make everyone a winner. 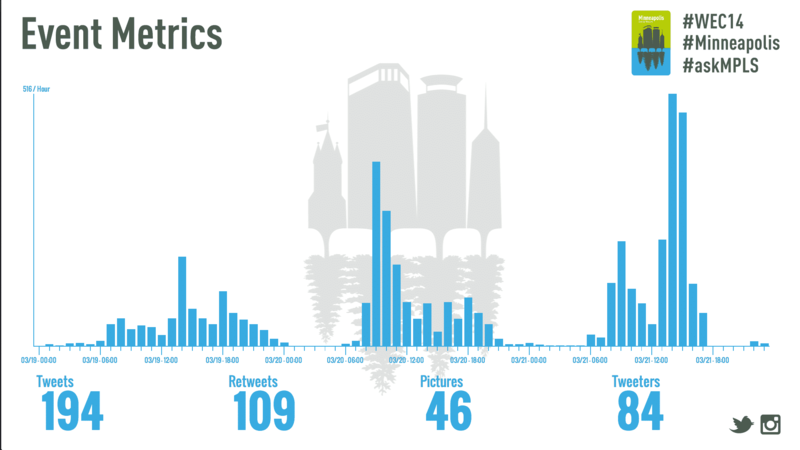 Show attendees how their individual tweets and photos contribute to the total social conversation around your event. Anchor a lounge or other physical space with a multi-screen social media hub. With SocialPoint you can integrate live metrics and leaderboards with eye-catching social content to draw attention to the social media impact from your event. Measure the impact of your social media reach and the effectiveness of your social media calls to action with our Dashboard tool. We created 7 different social media leaderboards to reward all different types of social media participation at your events. Upload, schedule and manage brand slide shows remotely. SocialPoint automatically switches from your social media wall to showing your branded slide shows. 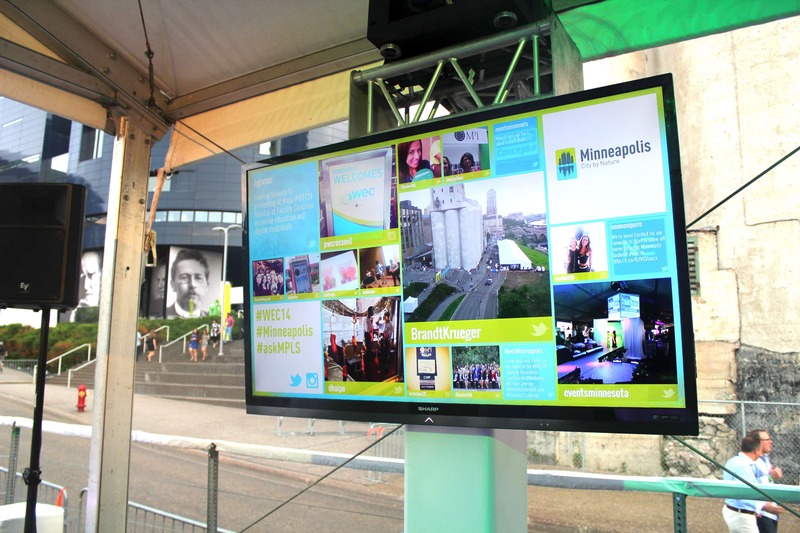 Our social media walls show data from Twitter, SMS (text) and Event photographer photos. 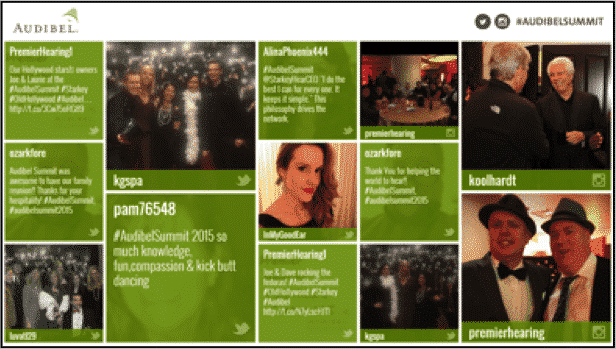 Configure your social media wall to match your event décor and branding. Build collages of social content or pick an individual template. 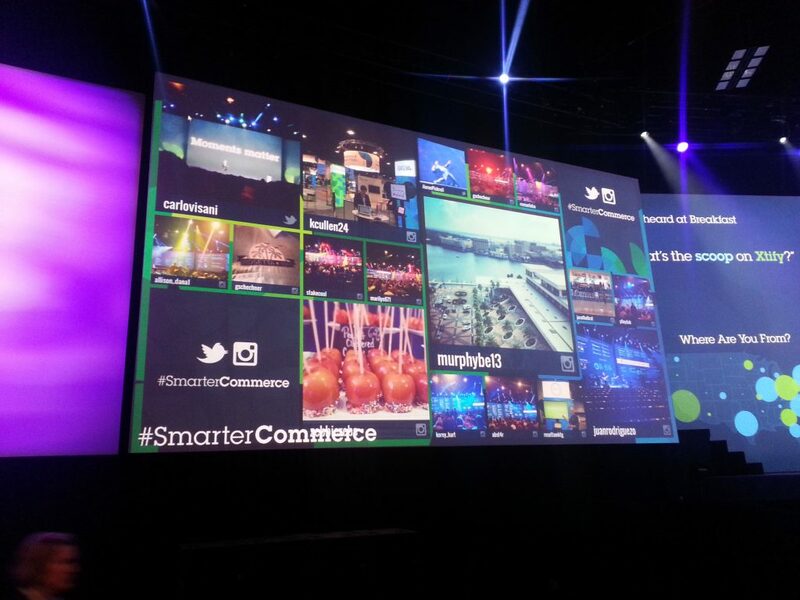 Our beautiful, animated social media displays make content flip, float, scroll and burst. Highlight your influencers and block the trolls. Stay in control of content published to your screens. Approve or hide any tweets, texts, photos or videos. Your customer success team is just one phone call away. They will be there to help you trouble shoot any setup issues and help you where you need it. Where Are Social Media Walls Used? 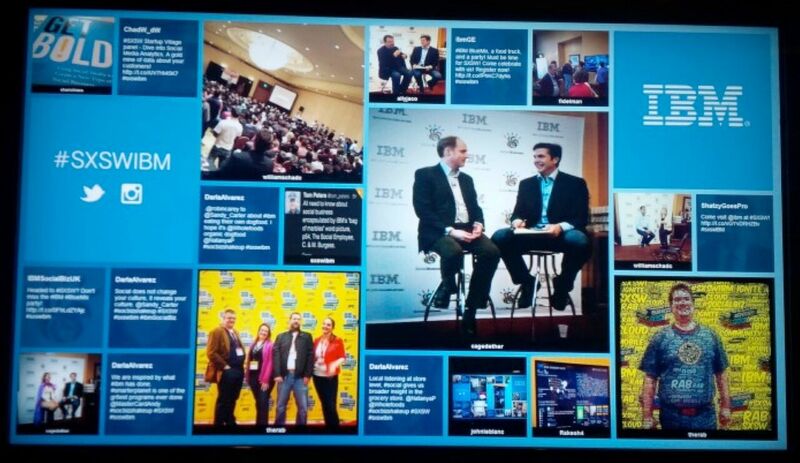 These fun, social media walls encourage attendees to participate and share content. Boomers will use SMS, Gen-Xers use Twitter and millennials use Instagram. Show content from all sources on your screens. SocialPoint social media displays can be used for walk-in, walk-out of sessions and monitors around the venue. 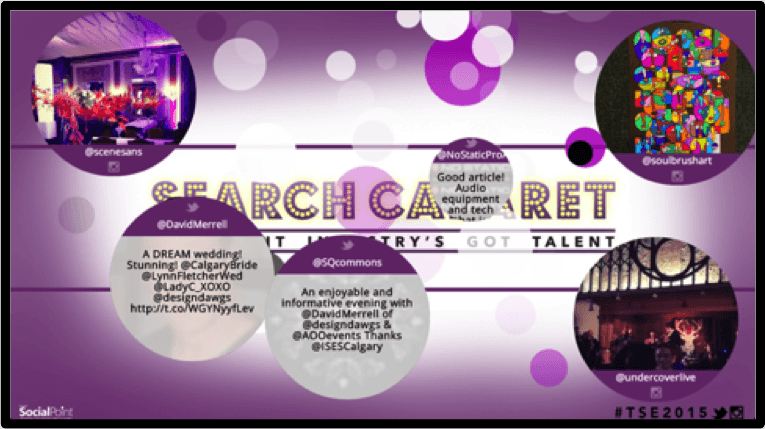 Clients may create special templates to match the theme of social events. Clients will setup social media walls on monitors around a venue. Then they use SocialPoint to schedule and remotely manage slide loops on the social media displays to allow their monitors to do double duty without needing expensive digital signage software.